Ivan, Jennifer and I woke up early on February 16, 2009. We were going on an Underground River Tour. The bus picked us up at 6:20 am. The drive to Sabang is about 2 hours long. Our group consisted of our guide Roman, 7 people and 1 monkey. We stopped after about an hour. There’s a great view from the top of the building. Ivan had a Filipino breakfast with a few locals. He had sticky rice and boiled eggs. Jennifer had a pancake with sugar on top. Sadly, there were no bananas. I’m glad I brought some along. I gobbled up my tasty banana. We arrived at Sabang. We had to wait awhile for a boat. 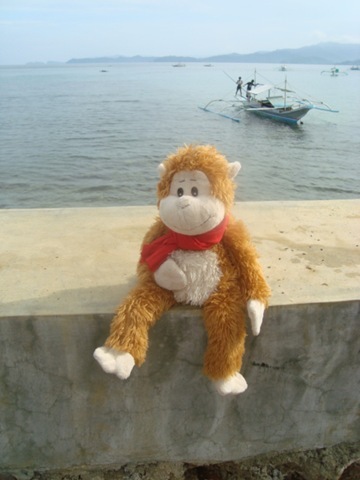 Each boat only carries 6 people and 1 monkey at a time. We chilled out for about 20 minutes. 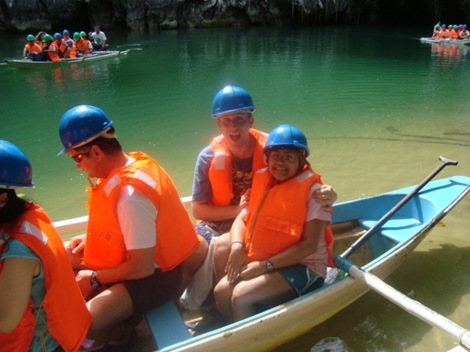 The boat took us to the underground river. First, you have to register your name in a log book. There was a long line of people waiting. There were a few monkeys hanging out in the trees. 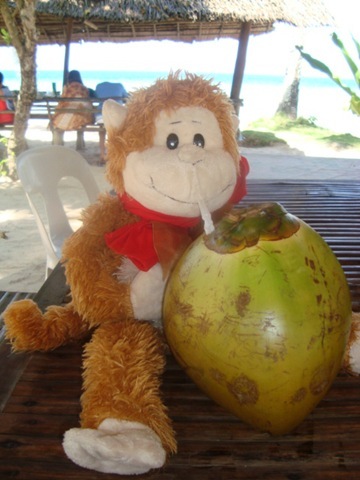 One monkey tried to steal my banana. I was too quick for him though! It holds 9 people and 1 monkey. Ivan put the hard hat on me. I thought we were already in the cave. 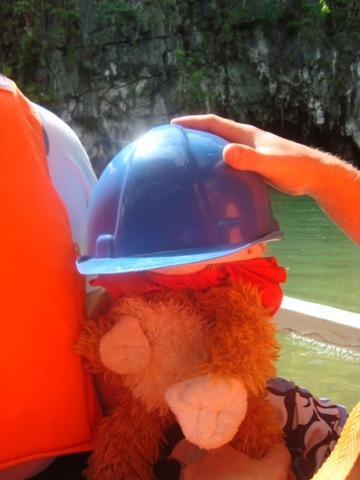 But, the hard hat was just too big for me, so it was really dark. Our guide paddled us into the cave. It was pitch black. In the front of the boat, a man was controlling the light. The guide would tell him where to point it. 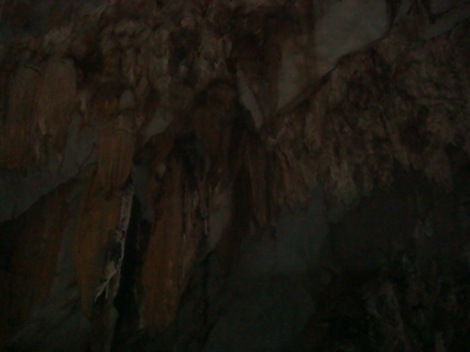 We were told about different things in the cave that looked like things like a bird, bacon or the Titanic ship. It actually looked like what he said. Since we were seated at the back, Ivan had to hold me up so I can see. 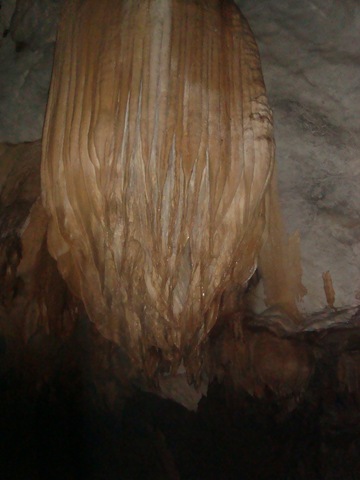 The cave has interesting stalagmites. 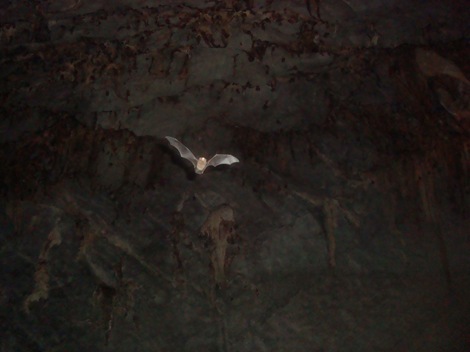 We saw a few dozen bats on the top of the cave. The ride isn’t that long – about 30 minutes long. Ivan inquired about why it was such a short ride. If it would be longer, the ride would be a 3 hour tour. But, it would require a special permit. 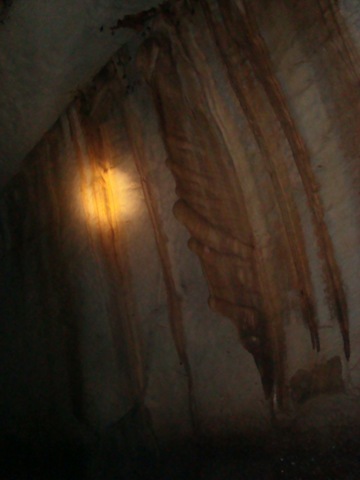 We wish the cave ride was longer. It seemed a little too fast too. We waited a few minutes for our group to finish. The guide Roman said he’d meet us in Sabang. He told us to walk 500 meters and lunch would be served at a restaurant. Ivan and Jennifer didn’t remember the name of the restaurant, only that it started with a T. Everybody in the group wasn’t sure which way to go. We weren’t told if it was left or right. So, we walked to the left first but didn’t find anything. Ivan finally asked somebody where the tours have lunch. The man said Teraw. We walked to the left. We reached Teraw. There was a buffet waiting for us. We gathered plates and gathered up some food. I added bananas to my chicken adobo. Jennifer had a plate filled with chicken adobo and rice. Ivan got fish and chicken adobo. A man brought over three coconuts for us to drink. A lady brought us coconut soup. It was really good with a few banana slices in it. The food was awesome. Ivan thought it was the highlight of the day. We were allowed to chill out. There was a nice beach right in front of the restaurant. It was time to head back. We all took a nap on the ride back. We arrived at the guesthouse at 3 pm. For dinner, we went to The Lotus Garden. Ivan saw it when we drove by it in a tricycle. The restaurant has a nice garden with a fountain. There are also rooms available. Ivan and Jennifer each got a cup of sake. I got a good banana and strawberry shake. I ordered Pancit with Bananas. Ivan and Jennifer got a Puerto Princesa Roll. It’s a sushi roll with fish and mango. The loved it! 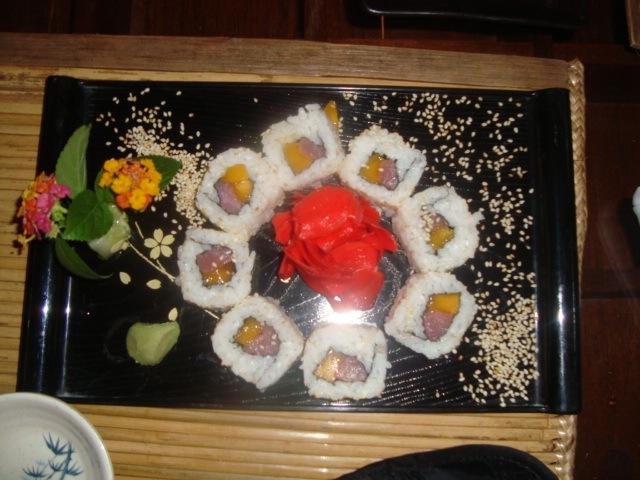 Jennifer wasn’t sure why places in Las Vegas didn’t think of putting mango in a sushi roll. 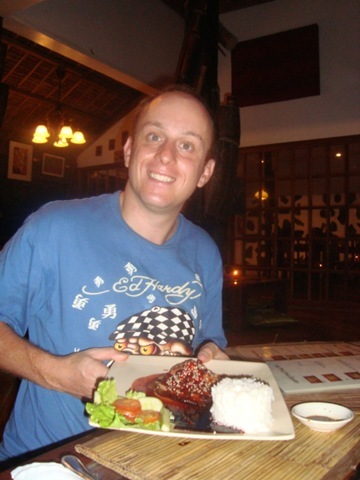 Ivan’s main course was the mahi teriyaki while Jennifer got the Spicy Malaysian chicken. The food was excellent. We went left feeling full and happy.